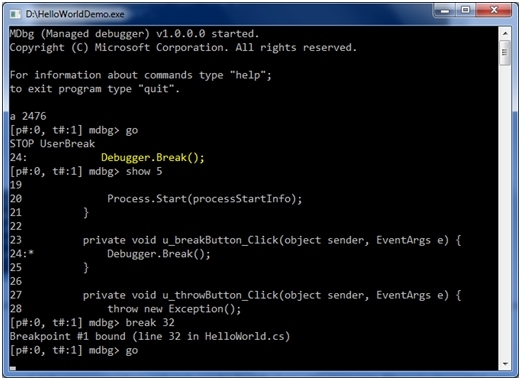 So we will first need to find a debugger, luckily Microsoft have released the source code for the command line MDbg debugger. I don’t know of any other managed code debugger for which the source code is available, so I went with this one. Integrating it into our solution is then just a matter of referencing the binaries from our project, this way we can launch it from within our code. You can find the zipped Visual Studio 2010 project at the end of the post, which has all the source code minus MDbg. 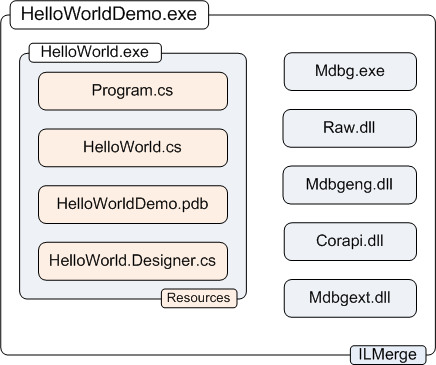 I usually don’t like my utilities to consist of more than a single executable file, so I often use ILMerge to combine all my assemblies into a single executable. The source and symbol files can be embedded into the executable as resources. That makes them easy to retrieve when required. The only downside is that we will have to build the project twice to be sure that Visual Studio includes the correct version of the source and symbols. I included the merging step with ILMerge as a post build step in the Visual Studio 2010 project. Note that ILMerge will even combine your symbol files into a single one. So this is the symbol file I included in the resources. The next task is to hook-up the Launch the debugger button. The trick here consists in using our single executable to either launch the actual application or the debugger. This could be achieved with a command line argument, but there is a better way. If we assume that we will only ever launch the debugger from within our already running application (i.e. 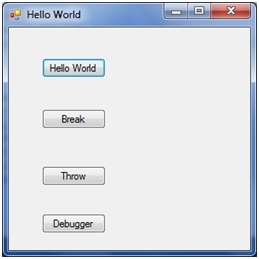 via the Lauch debugger button) we launch the debugger whenever the parent process is the application itself. When launching the debugger we can then just pass the PID of the parent process to get the debugger to immediately attach to it. Note that on Windows 7 and Vista the debugger will have to be executed with elevated privileges. The last step consists in passing the symbol and source files we have embedded in our executable to the debugger when requested. For this I had to hack into the source code of MDbg. In MDbg all symbols files are loaded from the file system not by MDbg but by the actual core! That’s not too good as I would rather prefer not to have to write to the local file system. Luckily there is a way of passing a symbol file in a stream, but it’s a COM IStream… To use that I would have had to implement a wrapper around a .Net stream which would be a real pain. Luckily this is has already been done by others and it wasn’t difficult to find a fully implemented one (see the links section a the end of the post). This is much easier as the loading of the source files is entirely managed by MDbg. Here I just had to replace the code which reads the source files with code which retrieved the file from our main program. 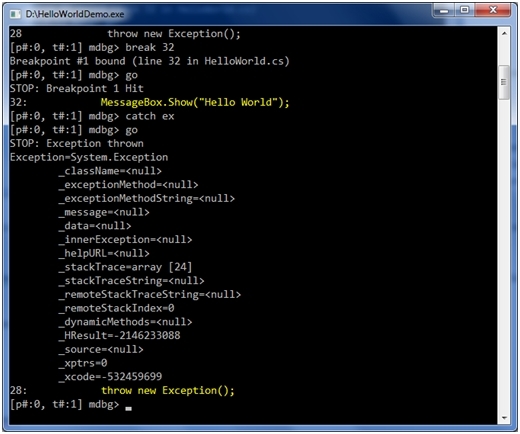 This is a rather limited demo of MDbg; it’s a pretty good debugger considering that it can be bundled up with your app. There is also a GUI extension to MDbg, but I will leave this for another day. Finally note that the full program with the embedded debugger is now about 1.5Mbyte in size. Sounds quite large, but everything is in there, source code, symbols and debugger. By the way, MDbg also support edit-and-continue, I haven’t tried it, but this could transform this exercise in something close to a form of C# scripting. Let me give you some implementation details. As the project is available, I will only describe the modifications I had to make to the MDbg source code. I also added to the same project Kornél Pál’s most useful wrapper class for the COM IStream interface. Make sure you #define NET_2_0 or remove the section for the .Net Framework 1.1 in the using section. You can download the attached zipped Visual Studio 2010 solution. You will only have to fix the references to mdbg and mdbgeng. You are now ready to try out your app. Beware that the debugger might be able to get hold of the symbol and source files independently of your hooks, so the best way to test the final binary is to run it on another machine. HelloWorld.zip, disclaimer: this code is only a proof of principle and has not been tested beyond what I describe in this post!